Tag Archive | "Hot Tubs"
Read about things that raise your blood pressure at www.heart.org/bpraisers. (NAPS)—Keeping blood pressure under control can mean adding things to your life, such as exercise, that help lower it. But you may not realize that it also means avoiding things that raise it. If you or someone you care about is among the one in three U.S. adults—about 80 million people—with high blood pressure, you need to be aware of these six things that can raise blood pressure and thwart your efforts to keep it in a healthy range. 1. Salt. The American Heart Association (AHA) recommends people aim to eat no more than 1,500 mg of sodium per day. That level is associated with lower blood pressure, which reduces the risk of heart disease and stroke. Because the average American’s sodium intake is so excessive, even cutting back to no more than 2,400 mg a day can improve blood pressure and heart health. 2. Decongestants. People with high blood pressure should be aware that the use of decongestants may raise blood pressure. Many over-the-counter (OTC) cold and flu preparations contain decongestants. Always read the labels on all OTC medications. 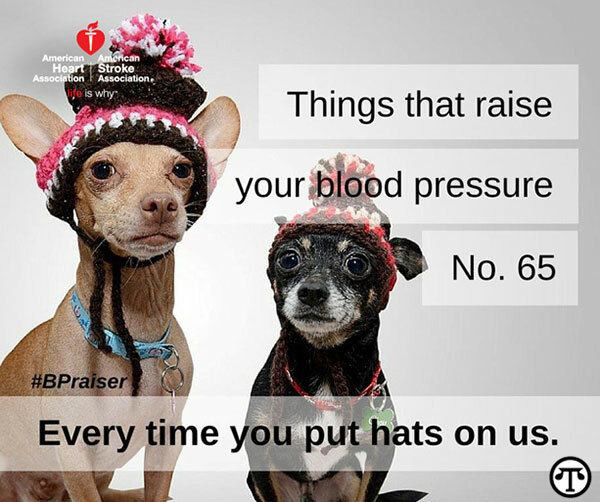 Look for warnings to those with high blood pressure and to those who take blood pressure medications. 3. Alcohol. Drinking too much alcohol can raise your blood pressure. Your doctor may advise you to reduce the amount of alcohol you drink. If cutting back on alcohol is hard for you to do on your own, ask your health care provider about getting help. The AHA recommends that if you drink, limit it to no more than two drinks per day for men and no more than one drink per day for women. 4. Hot Tubs & Saunas. People with high blood pressure should not move back and forth between cold water and hot tubs or saunas. This could cause an increase in blood pressure. 5. Weight Gain. Maintaining a healthy weight has many health benefits. People who are slowly gaining weight can either gradually increase the level of physical activity (toward the equivalent of 300 minutes a week of moderate-intensity aerobic activity) or reduce caloric intake, or both, until their weight is stable. If you are overweight, losing as little as five to 10 pounds may help lower your blood pressure. 6. Sitting. New research shows that just a few minutes of light activity for people who sit most of the day can lower blood pressure in those with type 2 diabetes. Taking three-minute walk breaks during an eight-hour day was linked to a 10-point drop in systolic blood pressure. For more information about blood pressure management, visit the American Heart Association at www.heart.org/hbp. Bayer’s Consumer Health Division, maker of Coricidin® HBP, is a sponsor of the American Heart Association’s High Blood Pressure website.